While the weather is still reasonable in WA, now is the time to enjoy Bootleg’s collaboration with their WA distribution team, the Hop Squad. The Flaming Youth names refers to a then scandalous 1920s novel and later silent movie about loose fashion, sexual awakening and experimental marriage. The book and movie became tied to the societal progression of Flappers (also known as the Flaming Youth) and Cake-Eaters, essentially the hipsters of the 1920s. While Flaming Youth Gose doesn’t have the sass and controversy of this cultural rebellion,? its youthful spirit screams: "Enjoy me now and damn the consequences!" Jazzy carbonation creates a bright white creamy head that offsets a bright but refreshing sourness on a beer that looks distinctly like Passiona. Passionfruit and salt levels keep a speakeasy like profile making Flaming Youth more of a cat’s meow quaffer than a chin stroking thinker. 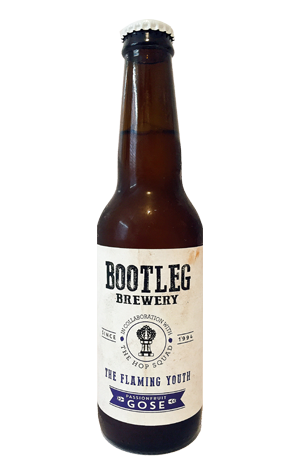 The Flaming Youth is available from good WA juice joints.